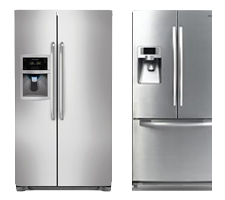 According to the existing user reviews and rating here are a few refrigerator models which are top selling. To determine the top selling refrigerator we looked at; Quality of available features, Durability, Price, Cleaning ease, Functionality, Styling. 1. Bosch B26FT70SNS 25.9 cu. ft. French Door Refrigerator with Adjustable Spill-Proof Glass Shelves, Exterior Ice/Water Dispenser, VitaFresh Food Preservation, SuperFreeze and Multi-Level LED Lighting. 3. Frigidaire FPHS2386LF Professional Series 22.6 cu. ft. Side By Side Refrigerator with 3 Sliding SpillSafe Shelves, 2 Humidity Controlled Crispers and Pro-Select Controls. 4. Samsung RFG237AARS 23 cu. ft. Counter-Depth French Door Refrigerator with Twin Cooling System, Cool Select Pantry, External Water and Ice Dispenser.